Thinner / PCB Cleaner / IPA for Mobile Phone Repairing is used to clean the PCB of a mobile phone or cell phone. 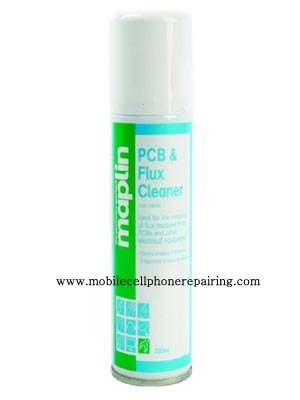 The most common PCB cleaner used in mobile phone repairing is IPA or Isopropyl Alcohol. It is also called IPA Flux. It is important to buy only good quality PCB cleaner as poor quality PCB cleaners can damage the board. It must be highly efficient cleaning solvent. It must be ideal for removal of flux residues. The chemical must not be toxic. It must not leave any residue. An aerosol container is best for cleaning type of PCB. Many manufacturers and suppliers and supply the chemical in containers with brush. I want to learn cellphone repairs and I am thinking of having an online training with you.Thank you. There are better Online Institutes. Please get enrolled and learn. goodn N Thanks For Web Site . Good N Help For us .All Best.